Grease the grill grate by brushing with oil. Preheat the grill to medium-high. 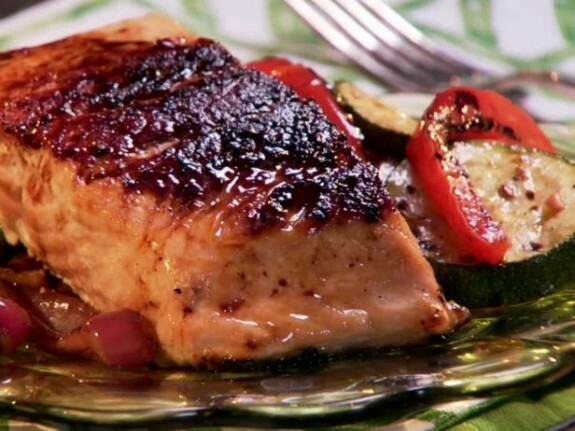 Generously sprinkle the salmon all over with salt and pepper.In a small bowl, whisk together the syrup, butter, mustard, vinegar, Worcestershire sauce, and 1 teaspoon black pepper to make the glaze.Brush the salmon tops generously with the glaze and place skin-side down on the grill and cook, about 4 minutes. Flip the salmon and cook until they reach the doneness you like, about 5 minutes for medium-rare. Carefully remove the fish from the grill and place skin-down on a pretty serving platter.